I bought new cycling shoes. They’re amazing. I bought the Louis Garneau Tri Air Lite shoes. 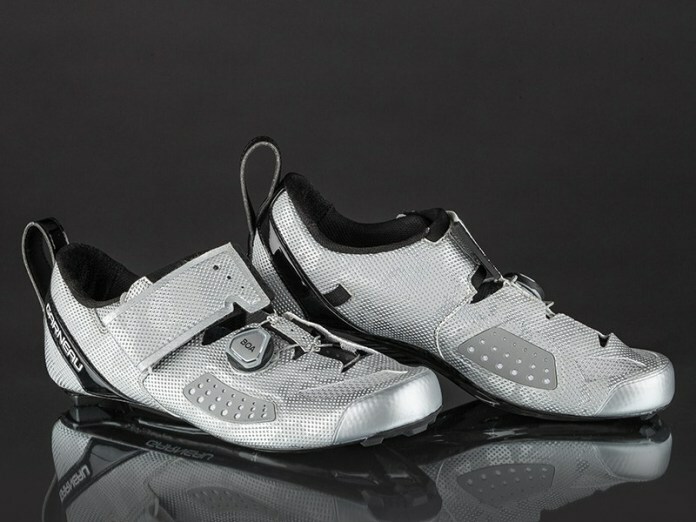 They are silver, include both a boa and a velcro closure, and additional arch support that is included with the shoes. I point out the arch support, because I bought some very nice Bontrager shoes when I purchased my Madone. They’re stiff, light, and bright pink. They also kill my arches. I blame this on Trek’s partnership with Superfeet, because they want to sell you a pair when you buy the shoes. I have since tried on various shoes including, Liv, Giro, and the Louis Garneau I purchased. One thing I was looking for in my new shoes was the inclusion of various arch supports that can be used with them. This is something included with all of the shoes I tried on. They typically some in a low, medium, and high arch support, with the medium in place out of the box. I always try the shoes on with the medium, then I swap them to the high if needed. The second thing I wanted was an upgrade from my current Pearl Izumi shoes. They were a big upgrade from my first shoes, since they had carbon soles and better ventilation, but they were looking rough at the end. 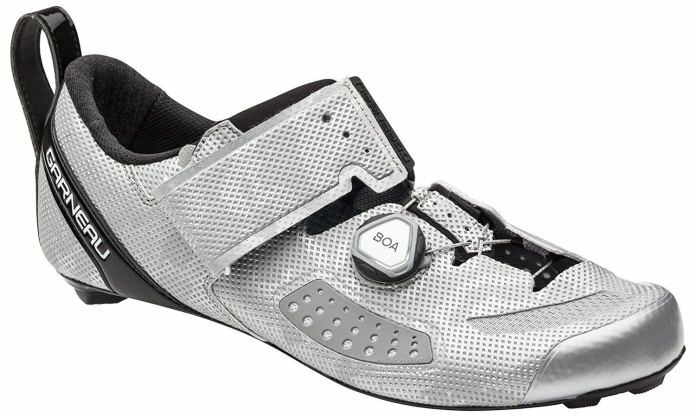 I have the Bontrager shoes as a good pair of road shoes, but I wanted a new pair of tri shoes as well. My first thought putting these on without stepping on the ground (which does nothing for cycling shoe sizing) was how I could feel my arches actually supported. I then did some more research about the wonderful shoes and found out more benefits than lightweight, arch support, and boa closures. A quick read of one article showed me the shoe was made to be the best triathlon shoe on the market. The outer material was made to reflect the sun’s light and in a home study by the writer of one of the articles, it actually kept the inside of the shoe cooler than other shoes. The shoe is also designed to accommodate swelling feet. Another weird thing about triathlon shoes I needed was the tab to pull them on in transition. This does not become a problem until I am just out of a river and trying to get on and tighten shoes. Between the boa and one strap system and the tabs on the back, I know I will gain at least a whole second from getting my shoes on, which will probably mean nothing, but it is nice to know I will be as fast as possible without a flying mount.